The adult moth is greyish in colour and is roughly 13mm in length. The wings are marked with two distince black zig-zag lines. The hind wings are a 'dirty white' colour. This moth is easily recognisable by its characteristic pose when at rest. It extends its forelegs, which raises the head giving a sloping look to its body. The Mediterranean Flour Moth is light-grey in colour and 6 -13mm in length, with a wingspan of roughly 23mm. The wings of the moth have two, dark zigzagging lines and the hindwings are a ‘dirty white’ colour. This moth is easily recognised by its stance: when at rest it extends its forelegs and raises its head, making the body look sloped. This is the only house hold moth that has this characteristic pose, so identifying the Mediterranean Food Moth relatively simple. The Mediterranean Food Moth is larger than the Indian Meal Moth but their feeding habits are similar. The larvae live and feed in small silken tubes that they spin. Their preferred foodstuff is flour, but they also feed upon grain, bran, and breakfast cereals. The life cycle of this moth usually takes about 10 weeks and the female lays anywhere between 110 and 600 small white eggs, which are usually laid in food products such as flour or cereals, attached to the grains. Typically the eggs will hatch in about 3 days into small, white or pink larvae, with a dark head and small black spots on the body. They immediately begin to spin silken tubes and remain within these tubes until fully mature, this usually takes about 40 days. Once the larvae are fully grown, they will leave the immediate area to look for favourable conditions to make their silken cocoons. Once they have done this they will turn into red/brown pupae and will be at this stage until the adult emerges after about 8-12 days. Although the life cycle can occur all year round, with favourable conditions, usually in warm weather during the summer months, they can complete the life cycle in 7-9 weeks. Other than identifying this moth by its characteristic pose, you can detect webbing in your foodstuffs. 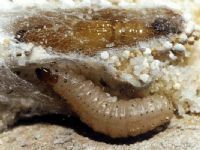 As with any type of food moth, look inside containers, often you will see the larvae within the actual food. Usually the larvae will cause food to clump together, which is easier to see with the naked eye. They don’t cause damage in the same way as clothes and carpet moth as they are generally found in food containers, obviously contaminating any foods they’re in. So to identify them this need to be done in food sources. Pest Expert Formula 'P' Foggers will kill off the adult population, followed by application of a residual insecticide such as Pest Expert Formula C Food Moth Spray to the internal panels of food cupboards and other affected areas. This should eradicate the food moth infestation, then it’s just a case of preventing it re-occurring. This can be done by making sure any dried foods are stored in sealed containers, eliminating a food source and breeding ground for these moths. Then just general good house-keeping can help in the fight of preventing re-infestation. 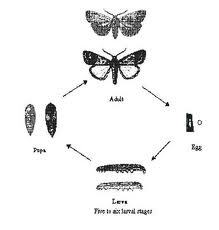 Monitoring activity can be done so with the use of Demi-Diamond Food Moth Traps. 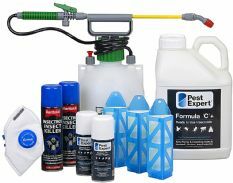 All of these products can be found in our Food Moth Control Kits along with a step-by-step advice sheet, a safety mask and nitrile gloves. Our Standard Food / Kitchen Moth Killer Kit is a collection of the very best food moth control products, perfect for getting rid of food moths in both domestic and professional kitchens. This kit provides you with everything you need to get rid of food moths in a contained area, including blue demi moth traps, which meet commercial kitchen standards. All our Food Moth Killer Kits are supplied with a step-by-step professional advice sheet to enable you to carry out a successful food moth treatment. For full details of this pack, please click on More Info. Our Advanced Food / Kitchen Moth Killer Kit is a collection of the very best food moth control products, suitable for treating food moth infestations in larger kitchens or commercial food processing plants or food storage premises. This Kit will get rid of both Indian Meal Moths and Warehouse Moths, and includes blue demi commercial kitchen moth traps. For full details, please click on More Info. Pest Expert Formula 'C' is a fast-acting food moth spray that kills food moths on contact and leaves behind an insecticidal residue that is effective for up to 4 weeks, offering long-lasting food moth control. (FROM JUST £7.49 WHEN BUYING MULTIPLES!). Pest Expert Formula 'C' is a fast-acting food moth spray that kills food moths on contact and leaves behind an insecticidal residue that is effective for up to 4 weeks, offering long-lasting food moth control. (FROM JUST £24.95 WHEN BUYING MULTIPLES!). 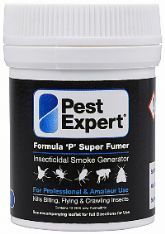 The Pest Expert Formula 'P' Super Fumer is a powerful 11g insecticidal smoke bomb containing permethrin which has a rapid knockdown effect on adult moths. The Super Fumer will treat an area of up to 100 cubic metres. Please Note: The Super Fumer can also be used in smaller rooms/areas for a more intensive treatment. 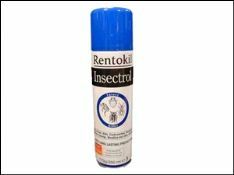 Rentokil's Insectrol Blue Spray, is a highly effective food moth killer product also capable of controlling a wide range of other crawling insects. This food moth control product has a rapid knockdown effect, but also a long-lasting residual, making it perfect for treating moth alighting surfaces, or for maintaining moth control in areas where food moths have been found. Use as part of a comprehensive treatment of a food moth infestation. The professional AF demi diamond kitchen / food moth trap is perfect for monitoring food moth infestations within a domestic or professional kitchen. Meeting commercial kitchen standards, the colouring of this moth pheremone trap also makes it suitable for most food processing or storage premises. Suitable for detecting / trapping of both Indian Meal Moth and Warehouse Moth species. (EACH PACK CONTAINS 3 x TRAPS and 10 x PHEREMONE LURE PADS).